The numerous connectors available in our shop ensure secure electrical contact and connect various components. 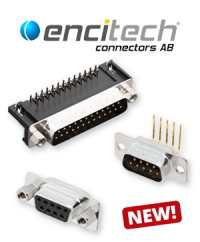 Beside connectors for audio and video applications we carry Board-to-Board and Board-to-Wire connectors. Up for order as well are our diverse DIN connectors like DIN 41612 connectors or DIN 41651 pin connectors and PCB connectors. 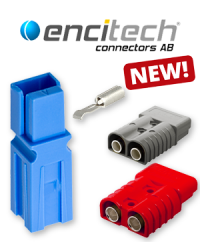 Specifically for high-frequency technology we carry RF connectors and coaxially designed connectors. IEC and power plugs supply current to electrical devices. Also found in our shop are spring contacts, terminal strips, interface blocks, pin headers and female headers. 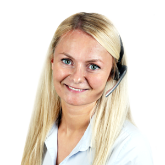 For telecommunications and computers we carry network, USB, FireWire and various other telecommunications connectors. The assortment is rounded off by D-Sub, flash card, SIM card, industry, laboratory and measurement connectors. 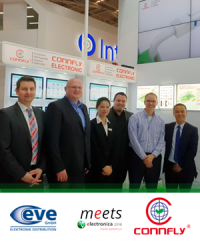 A delegation from EVE met today with the Chinese manufacturer CONNFLY Electronics. Our colleague Miron Over is responsible for purchasing accessories for Test & Measurement. 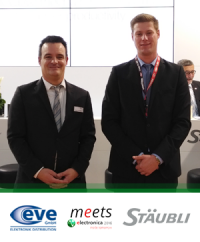 In this capacity, he visited the Stäubli International Group at electronica today. 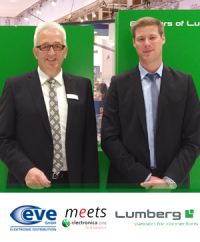 The German manufacturer Lumberg Connect was visited today by our colleague from purchasing Miron Over. 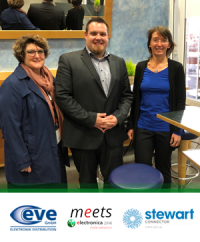 Mr. Oliver Wermers, line manager for connectors, visited the manufacturer Stewart Connector at electronica today. 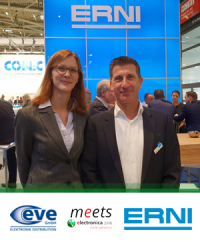 Our colleague from Purchasing Christin Wichmann visited Dirk Fischer at the ERNI Electronics booth today. 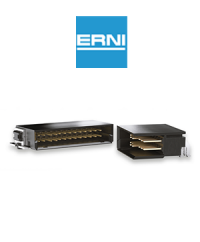 ERNI Electronics has extended its comprehensive SMC connector family in a 1.27 mm pitch with hot-swappable variants. We have added more than 700 new D-Sub housings to our online shop. 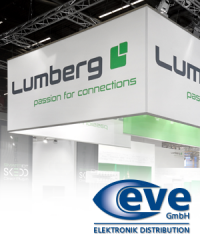 EVE is the new distributor of Lumberg Connect. We rejoice in the expansion of our product line card. 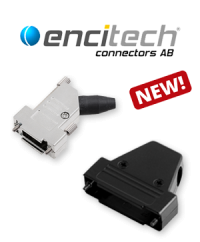 As of now, we are an authorized distributor of Lumberg Connect, a German manufacturer of connectors.